An unsung American hero played on a bittersweet field where the personal intersected sharply with the political. Thanks to her, there are now over 300,000 girls playing Little League. Last week I found myself in a room full of some of the most recognizable trailblazers of the women’s movement for the launch of Makers, a new AOL/PBS initiative. There was Marlo Thomas, who portrayed the first single working woman on television. And Robin Morgan, who led women to throw their bras in the trash outside the 1968 Miss America pageant. But the person who truly captured my admiration was not so famous. 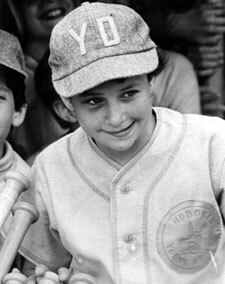 In 1972, when Maria was 11 years old, she tried out for the Hoboken, NJ Little League. She became the first girl in more than 20 years to even try to participate in one of America’s most beloved youth pastimes. With a strong-arm and a determined attitude, she made the team as a pitcher. Unfortunately, Little League bylaws dictated that girls were not allowed to play. They quickly removed Maria from competition, even taking away her beloved uniform. The National Organization for Women brought a suit on behalf of Maria’s right to play in 1973. As the case made its way through the courts, Maria and her family endured harsh scrutiny, intimidation and threats. The good news: The New Jersey Superior Court ruled in 1974 that the Little League must allow girls to play. The bad news: Maria was then too old to play. That kind of disappointment can kill your spirit. But not Maria’s. When I met Maria last week, I was with my friend Jill Savitt. Back in 1977, Jill was the catcher on a Ramsey, NJ Little League team, one of the first to allow girls. Jill told Maria that she was put on a team called the Beavers. When the she went to shake boys’ hands after games, she found that many boys flat-out refused or first lathered up their hands with spit. Still, Jill and other brave girls across the country kept right on playing.